By 9:30 on any Tuesday or Friday morning, the outdoor market in my neighborhood is abuzz with customers. At the produce stands, all the fruits and vegetables have been carefully and artfully displayed, each with a small handwritten card marked with its price and place of origin. Jean Jacques, the cheese monger, is having a cup of espresso at the café across the street leaving his wife, Josette, to tend to the early customers. The butcher has such devoted customers that the line forms early. Some of these clients were buying meat in the same place when his father ran the business. On the Square Jacques Demy in Paris, specifically in Montparnasse, the 14th arrondissement. Until a few years ago, it was simply called “Place du Marché” but as often happens, a place name is changed to honor a distinguished neighbor. Neighbor Jacques Demy, who died in 1990, was a famous film director whose work included The Umbrellas of Cherbourg. His wife, Agnes Varda, herself a very important film maker, still lives in the neighborhood and was on hand for the dedication of the little square. In his speech, Mayor Castagnou of the 14th suggested that given its beauty and simplicity, the little square could easily have been the setting for one of Demy’s movies. Surrounded by the soft yellow stone of Parisian buildings, the marketplace in this Left Bank neighborhood is a plain stretch of asphalt with a few trees. On Monday and Thursday afternoons, city workers arrive to set up all the metal supports and canopy covers necessary for each stall. The following day at the close of the market, the workers reappear, remove all the equipment and with their hoses and trucks, set to cleaning every inch of the square. This market is but one of dozens of neighborhood fruit and vegetable markets all over Paris. There are covered markets such as Marché des Enfants Rouges in the Marais, the oldest market in Paris started in 1615. The Marché Beauvau, also called the Marché d’Aligre, in the 12th arrondissement is one of the cheapest and liveliest covered markets in the city. On the left Bank, the ‘Bio’ market on Boulevard Raspail which only sells organically grown produce, is the chic and expensive place to shop. For two weeks in September, Parisians are treated to a floating market from the southwest of France with barges lined up at the Quai de Montebello loaded with all sort of regional delicacies such as foie gras, cassoulet, magret de canard, stuffed prunes and floc de Gascogne, an aperitif. While workday schedules prevent many from shopping regularly at their local markets, Parisians are nonetheless passionate about preserving the custom. They believe the food is fresher, they enjoy seeing their neighbors and they have a personal rapport with the vendors. Are things cheaper at the neighborhood markets? Non! Quality over quantity is the driving force for frugal French shoppers. Food in France is expensive compared to American prices but a typical French family does not spend a lot more than its American counterpart. The reason is simple: the French buy and consume less food. While they pay more per item, their spending overall is within reason. It is completely acceptable to buy small amounts at the markets and even in large grocery stores. For example, if you only need one or two stalks of celery to make a broth, that is all you need buy. The vendors at the produce stands have their knives ready to slice off a few ribs of celery. In the early fall, pumpkin or melon is sold by the slice and herbs are sold by small handfuls. Shopping for one is quite common. An enormous number of Parisians live alone, many of them elderly and many in buildings without an elevator. It goes without saying that most of these solitary city dwellers do not own a car, do carry their purchases, and depend on nearby shops. My neighbor, a lady on a very slim income, enjoys a slice of ‘jambon à l’os’ for her dinner which she purchases from the market’s charcuterie. This slice of ham costs her about $3.00 but it is her main meal of the day, augmented by a small salad and a few slices of baguette. At the butcher, the purchase of a thin sliver of ‘onglet’ (hangar steak) is treated as seriously as any other purchase. “Pour combien de personnes?” (How many are you serving?) is the first question the butcher asks and the appropriate (i.e. modest) portion is cut. I was at first astonished to see small pieces cut from whole beautifully tied roasts but now I appreciate the lack of waste and respect for the customer. You will be told exactly how to cook your purchase. With a tiny oven in my apartment and little experience with its temperature gauge, this advice proved to be a godsend. I was surprised at how often the French eat meat. Daily. Not a lot, mind you, but quite regularly. Ordering a ‘bifteck’ or ‘filet’ was easy enough but I was astounded by all the other cuts and each has its own special preparation. Notice the two diagrams of French cuts of beef. 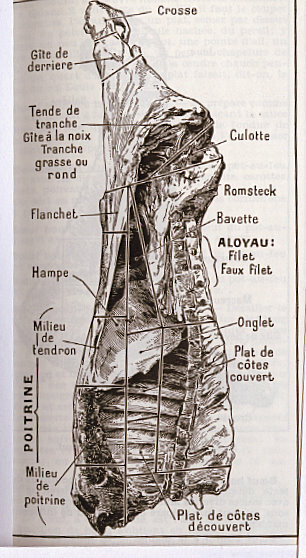 The difference between American and French cuts of beef (which Julia Childs explained so well*) is that French butchers separate the meat along the muscle and do not cut across the grain. The result is a large number of smaller nuggets of meat each with their own flavor and cooking method. As a part-time Paris resident for the past several years, I have begun to understand the workings of the local markets a bit better. Some of the farmers go to only one public market a week; others, such as the butchers, travel to several a week. The stands vary a lot in quality, price and variety. The most cherished vendors are the small producers from nearby farms. Some work seasonally such as the lady who drives from Normandy twice a week with her oysters, bulots (sea snails), and small clams. One farmer, Monsieur Guy, sells year ‘round but in January, his stand has mainly potatoes, onions, walnuts, a few winter fruits, and a limited number of chickens. These individual farmers have less to sell and at higher prices but customers value the quality. For bargains, there are large vegetable stands that have every possible fruit or vegetable from all over the world. This produce comes directly from Rungis, the big wholesale market outside of Paris. As mandated by law, every item must identified by its country of origin. It is up to the customer to decide whether to buy locally or pay less for an imported product. Most do a bit of both. I can not go to the market without a visit to Jean Jacques, the cheese man earlier mentioned taking his morning break. His business is artisanal as he only sells cheese, butter, cream, and yogurt from very small selected producers. The man loves cheese and I have been thoroughly educated about cheese by this cultivated and voluble expert. He offers a typically French approach to the customer. One Friday, my husband consulted Jean Jacques about what cheeses to serve for a dinner party we were planning. Even though there were several customers waiting, Jean Jacques immediately had a barrage of questions. “What is the menu?” “Are your guests French?” How many are coming?” and so on. None of the waiting clients were the least disturbed by the lengthy conversation carried on in both broken English and French and in fact, some left with a wave and a smile to return later. Having guests to dine is a serious matter in which civility, hospitality, and even amour propre (self respect) are at stake. Later that evening, when our friends exclaimed over the extraordinary selection of cheeses, we were grateful indeed. It was done and it was delicious. Buying fish was a challenge until I went shopping with my friend and culinary professional Francoise Meunier. 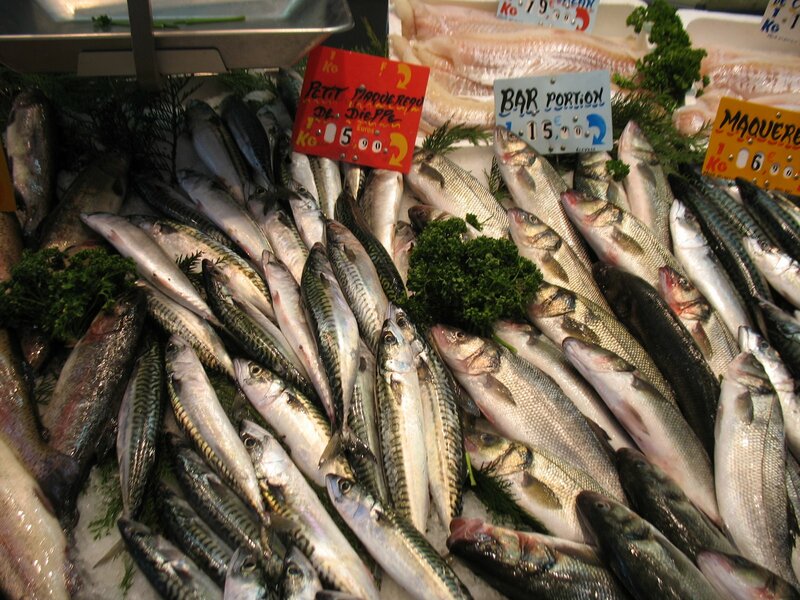 As with the butchers, the fishmongers know their product and are prepared to do much more than weigh and wrap. Francoise advised buying whole fish (fresher! ), having it filleted, and saving the bones for a broth. She recommended mackerel, especially the very small ones called lisettes. For special occasions, Parisians go to the market with their platters, have the fishmonger open oysters on the spot, and then dash home to celebrate. Other artisanal stands offer breads and cakes, ‘Bio’ or organic produce and a real rarity: the horse butcher. As I scurry by, I notice her offerings of horse steaks, roasts, sausages and ground meat are not in great quantity but everything is sold. There are two flower sellers and both do a good business, creating wonderful hand-tied bouquets to order. Plants sell well too as most city dwellers with even a small window will fill it with a box of geraniums. Nearby, the Lebanese stand is like a heavenly take-out shop: flat breads cooked to order on a hot grill, unctuous hummus and baba ganouj, stuffed grape leaves and more. As my market basket comes heavier, I make a final stop at the épicier. Dried fruits, nuts, spices and various condiments are the purlieu of the épicier. Looking for pesto? Preserved lemons? Ten kinds of olives? Orange flower water? It’s all here waiting to be weighed out into little plastic bags and cartons. Some of the old stands are disappearing: the gentle honey seller retired last year as did the lively milk, chicken and egg man who always claimed his cream had resided in the mammary of his cow but six hours earlier. In their places, there are now a few nondescript clothing stands and a mattress seller but the focus is still the food and the experience of buying it. By early afternoon, the vendors are packing up, folding up their cases and tables and filling up their small trucks with the remaining wares. The two butchers still in their coveralls are enjoying an aperitif at La Comedia, a small restaurant on the square which locals call ‘the Portuguese’ in deference to the proprietor. Soon, the square will be washed down and clean ready for the afternoon schoolchildren running, skating, and chasing the ball. Another market day is done at the Square Jacques Demy. Preheat the oven to 425. In a small baking dish just large enough to hold the cheese, place the Vacherin and poke 5 or 6 holes in its surface. Pour the white wine over the top and push the shallot into the surface. Cover with foil and bake about 15 minutes. Serve with spoons and baguette. Arrange the mackerel on a lightly oiled baking sheet (or use a piece of baking paper on the pan). Cut three slits along the body of each fish and daub with mustard. 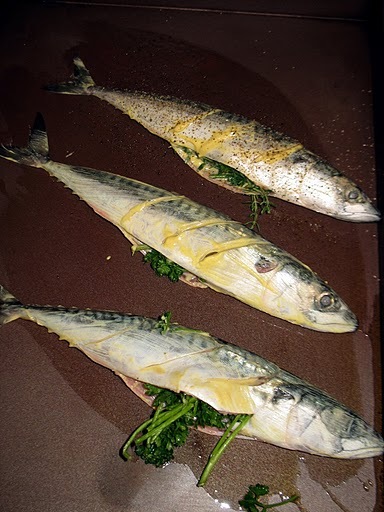 Stuff a sprig of parsley and thyme and a bay leaf inside the cavity of each fish. Sprinkle with pepper. Bake the fish for 10 to 15 minutes. French beef is mostly grass-fed and tends to be a bit tougher than American beef but very tasty. Typically, steaks are quickly cooked over high heat and served rare. Heat one tablespoon of butter and the oil in a frying pan over high heat. When the mixture is very hot, add the steaks and sauté for about 2 minutes. Turn and sauté until the top of the meat glistens (about 2 more minutes). Immediately, remove the steaks to a warm plate. Wipe out the pan; add 1 tablespoon butter and the shallots and sauté about 5 minutes on a low flame. Season with salt and pepper, add the vinegar and the remaining tablespoon of butter. Stir and pour over the steaks. In Paris market, beets are sold cooked which makes the following salad a snap to make. The vinaigrette is a fairly sharp one to offset the sweetness of the beets. Slice the beets into rounds and arrange on plates. Make vinaigrette by adding olive oil slowly to the vinegar. Season with salt and pepper and drizzle over the beets. Garnish with the walnuts and parsley. *To cook beets, wash them well and trim the stems. Simmer in water to cover until tender, about 30 minutes. Drain. When cool, the skins will peel off easily. Wear gloves to avoid red fingers. The market charcuterie sells hachis Parmentier ready-made but this classic dish is easy to prepare from scratch. ‘Parmentier’ refers to Lord Parmentier who introduced the potato to France. Like its English cousin, Shepherd’s Pie, hachis Parmentier is a budget dish, often made with leftover roast or stew. Peel the potatoes, boil them until tender, about 30 minutes and drain. Cook the onions slowly in a skillet for 10 minutes with one tablespoon of butter. Add the ground beef and garlic and season with salt and pepper. Cook for 5 minutes. Mash the potatoes and add the butter and milk. Season with salt and pepper. Butter a baking dish and put in one half of the mashed potatoes, covered by the meat mixture and finally, the rest of the potatoes. Sprinkle with the shredded cheese. Heat for 15 minutes until the cheese is melted and bubbling. Marché Enfants Rouges – Oldest public market and as my friend Francoise tells me, it is so named because an orphanage was located next to it and the children all wore red clothing. Sunday, 8:30 am to 2:00 pm. March d’Aligre and Marché Beauvau – A covered market. Very bustling on the weekends. Also, while you’re there, check out the wine bar Le Baron Rouge. 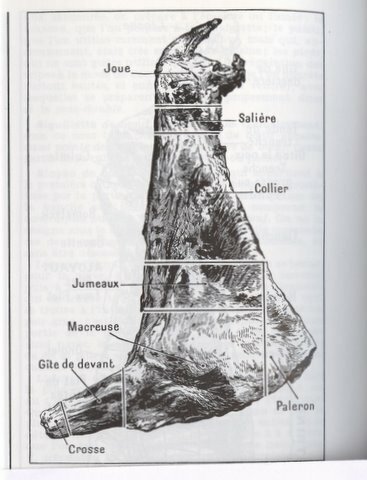 * see Volume I of Mastering the Art of French Cooking, Chapter 7 ‘Meat’ for a discussion on American vs. French cuts of beef and how to select cuts that approximate the French ones. “What would our lives be like without tradition? What terrible fatigue would overwhelm humanity if it only had to concern itself with the future? At Chronicle Books, Bill Le Blond publishes cookbooks known for their splendid photography. For those hoping to publish however, he has bad news: cookbooks are not the sellers they once were. While there are more writers than ever, readership has dwindled. These days, finding a recipe is just a click away. For a while, everyone was reading cookbooks for fun. Salsas! Chocolate! Slow Cooking! The I-Can’t-Chew Cookbook! You name it, there’s a book all about it. But this hobby may have run its course. True collectors of cookbooks are a special and passionate group. A bit like stamp collectors. My friend Vikki says, “For me, going to eight or nine sources to answer a cooking question is pure pleasure. That these sources are on my bookshelf is icing on the cake.” For the majority of home cooks, however, one or two all-purpose cookbooks, newspaper clippings, and a couple of local compilations sufficed until recently. I risk sounding disingenuous. After all, I myself have written a nifty little cookbook and am always thrilled when someone buys it. Nevertheless, just as Wikipedia and Google are today’s reference tools, Internet cooking sites are where you find recipes. And from TV chefs. Cooking shows have filled the gap for the entertainment minded cook just as Epicurious is there at day’s end when you’re standing in the kitchen wondering what to do with one onion and a package of chicken. But is that the whole story? Have we simply abandoned the crusty old tomes for (equally) sticky keyboards and remotes? What about word of mouth? “How did you make that?” Dedicated cooks love that question and most will go out of the way to share. Even the pros. When I had doubts about a fish recipe from Happy in the Kitchen by Michel Richard, I called his restaurant, got the sous-chef and explained my concern. He reassured me the recipe would work. “10 minutes! Not more! Call anytime!” he said and I believed him. The fish turned out perfectly. A word of caution: if you are an adventurous cook and want to call a chef, remember the hours of service are frantic. Call only in the morning or late afternoon if you want to get some attention. Asking how a dish is made is perfectly acceptable in a restaurant and, if your waiter is not run off his feet, the information is gladly given. You may not be able to replicate the dish but you will know the ingredients. Skill and imagination, not a recipe, make for glorious food. Which explains why recipes ( that is, the ingredients and measures) can not be copyrighted because you can’t claim ownership of a fact. Apple Pie and Beef Stew are public property. However, the language of recipes is considered original so you can not simply copy and publish someone else’s take on a recipe. Those How do you make that? conversations are not just about cooking. My father would call regularly asking for the same two recipes: fried chicken and Hollandaise sauce. I remember thinking, “Why doesn’t he write it down?” but I came to love those requests. It reminded us both of my grandmother (a Hollandaise maker extraordinaire) and of the days when fried chicken was a once-a-week meal. Now, when my grown children request a recipe, I am equally touched. During World War II, my friend Monna remembers the meager meals at her school outside Paris. “Once a week we’d have a treat of fresh bread from the local baker. With each bite, we’d pretend it was something we really loved. Roast chicken! Chocolate cake!” Longing for full stomachs, the girls dined on their food memories. Her experience brought to mind the poignant In Memory’s Kitchen: A Legacy from the Women of Terezin, an extraordinary collective memoir by starving prisoners at a Czechoslovakian ghetto/concentration camp. Written by a number of different hands, the original manuscript (now in the Holocaust museum in Washington, DC) contained remembered recipes from their former lives. Attempting to resurrect those lives, these women nourished and somehow sustained themselves through memory. The writing of this collection was no quiet activity either: arguments flared over the correct way to make a certain dish. “We never used eggs! There was much more sugar!” And thus time passed. My folklorist friend Miriam first told me about interleavings. These are scraps of paper, ticket stubs, old envelopes, receipts, and all manner of jottings found in cookbooks. A treasure trove of information for anyone curious about a family, a community or an area. I knew immediately what she was talking about having gone through many old family cookbooks. In one old book belonging to my mother-in-law, there were letters between friends containing recipes but also plenty of news and gossip. Putting some pieces together, I realized these folks lived no farther than 30 miles apart but rarely used a telephone. Word of mouth via the pen. I found the interleaving pictured above in Leslie Forbes’ beautiful book A Table in Provence. I might not have remembered that my friend Rolf gave me the book if I hadn’t seen his hotel bill (and the dried flowers). A social scientist might find it interesting that in 1987, an American couple spent the night at the Hotel Beaurivage in Cros-de-Cagnes, had breakfast, and it cost less that $25.00. Asking questions (Where do you shop? What about farmers’ markets? Where are the bargains?) eases you into a new neighborhood. If you’ve just moved, word of mouth information gives you a jump start in the process of feeling at home. For new parents, the world of baby food is much more compelling to talk about than to read about. Dieters, folks cooking for one, heart patients, party givers, in short, everyone benefits from direct talk about food. So, don’t forget to ask your Aunt Tilly for that chocolate cake recipe before she gets any older. Here are a few recipes I pass around frequently. * Eggs shells will stick to very fresh eggs. After about a week, the interior of the egg and its membranes will shrink slightly, creating an air space. After hard boiling, the egg is plunged into ice water which slightly contracts the contents and when cracked, it’s shell slips off. I really like zucchini raw and came up with this salad and it’s gotten a lot of raves. I do not add the dressing until just before serving – the salad should remain cool and crisp! In a bowl, toss the zucchini, cilantro, nuts, and shallot. Combine the remaining ingredients, whisk thoroughly, and mix into the salad. Strip the stalks from the Swiss chard leaves and cut them fairly finely. Put in a saucepan with a small amount of water. Cover and bring to a boil. In the meantime, cut the leaves into fine shreds and then crosswise (so that the shreds are not too long). Add these to the pot with the stems and cook a few minutes or until just tender. Drain and cool. Toss the chard with the zucchini and nuts. Combine the remaining ingredients to make a vinaigrette and pour over the salad. Toss well. I have been asked for this recipe more than any other. I got the recipe from my sister-in-law Debbie and changed it a little, using peanuts rather than peanut butter. That’s the secret! In a food processor, grind nuts until fine. Add everything else. The dip will become quite thick and can be thinned with water or tea. Serving suggestions or Are you ready for this? Main dish: as a sauce with cold soba, udon, or rice noodles. Thin the spread with a little water or cold tea just to a pouring consistency. Garnish with chopped peanuts and mint. Also, as a dressing. Thin the spread with tea or water and add diced cooked chicken or turkey, chopped red peppers, carrots, and green onions. Serve on a bed of shredded napa cabbage. Dessert: use a dollop on top of vanilla or coconut ice cream. Garnish with mint. Or spread a thin layer on ginger cookies and fill with ice cream for ice cream sandwiches. What I can tell you about fried chicken is that if you make it often, it becomes very easy. The problem is that virtually no one eats fried chicken every week so it’s a bit harder to get practice. I learned this method of frying chicken from Margaret Miles, now in her nineties. She has lived most of her life in Kentucky and her recipe is, I believe, as genuine as it gets for southern fried chicken. She always drained her chicken on newspaper and I still do that but you may prefer paper towels. In a paper bag, combine the flour and seasonings. Margaret only used salt, pepper and paprika but I like a bit of dried herb which I rub between my fingers as I add it. In a large heavy skillet (cast iron is best), heat oil to a depth of about ½ inch. Heat up to nearly smoking. As the oil heats, shake several pieces of chicken in the flour mixture. Carefully, slide a piece into the oil. If it immediately starts sizzling, the oil is hot enough and you can add the rest. Cook about one or two minutes just to ‘seize up’ the chicken pieces and then turn them. Again, cook one to two minutes. Turn again, lower the heat to very low, cover the pan and cook for 15 minutes. In the middle of the cooking time, carefully turn the chicken (the coating will be soft and fragile). After the cooking period, turn up the heat all the way, remove the cover and cook on each side until it is as browned and crispy as you like. This will take about a minute per side. Don’t walk away during this step. Remove and drain on paper towels. Salt each piece and serve immediately. Also good cold. A fresh good quality chicken does make a difference in taste and is worth spending a little extra on. In the US, the thinking now is don’t wash chicken – it just spreads bacteria around the sink. If you do wash it, it should be lightly patted dry (not bone dry!) before shaking with the flour. Frying: Never drop food into hot oil – always slide it and take care turning it to avoid splashing. I use metal tongs so that the meat isn’t pierced when I turn it. The oil: it must have a high smoke point such as peanut or canola. Margaret used Crisco and that’s what I use. Crisco is now trans-fat free. Covering the chicken: leave the lid a bit askew so the steam can escape. Otherwise when you remove the lid and turn up the heat, you risk a lot of painful grease popping. Cooking time: 15 minutes covered time is an approximation. Don’t overcook it or it will be dry. If I’m cooking a lot of chicken, I use two pans and cook the thighs and drumsticks separately from the breast as dark meat takes longer to cook. Also called milk gravy, this stuff puts you over the top in every way imaginable… it’s good on biscuits, mashed potatoes, or rice. You can also make this gravy using chicken stock (it just won’t be cream gravy). Drain the oil out of the fried chicken pan reserving all the crunchy bits. Add the flour and stir over low heat for a few minutes to cook the flour. Last night, when I managed to set my own hair on fire, I was reminded that the laws of nature must be obeyed. I had added a small amount of wine to a pot and covered it. A minute or so later, I raised the lid, bent over the pot, and whoomph! The vapors ignited. Happily, I was wearing my glasses or I would be minus eyelashes. An unpleasant truth: cooking hurts sometimes. And a lesson: don’t be cavalier. Even if you’re an experienced cook, being mindful of the basics when it comes to fire and knives will save your skin (and hair). The other day, my grandaughter, Zane, grabbed a hot cookie sheet out of the oven only to realize there was no place to set it down. Even an oven mitt won’t keep the heat out forever. When you move any hot item, know where you’re going and clear a space in advance. With a gas stove, a pan that’s boiling over is easy to fix: cut off the gas. With an electric stove, be careful and move that pan slowly to avoid getting splashed. To avoid cuts, anchor your chopping board. If the board is moving around, your chances of cutting yourself are high. I put a damp paper towel or a dishtowel under mine and it won’t budge. Thin plastic cutting sheets are a menace in my estimation. Get a heavy duty chopping board, anchor it, and chop away. If you’ve got a knife in your hand, keep your eyes on it. Don’t look around the room whilst chopping. Don’t point with your knife. If you’re talking, put your knife down. It seems so obvious but it’s amazing how often we cut ourselves just by not looking where that blade is headed. A cut finger was a small price to pay for the chance to teach some cooking classes as part of Share Our Strength’s Operation Frontline in Washington, DC a number of years ago. Tami Parr of the Pacific Cheese Project and Kathleen Bauer with the blog GoodStuffNW have spread the word about this mounting problem and ask that we help out the Oregon Food Bank or a program in your state and community. Clicking the above logo will whisk you to the food bank site. Contributions are gratefully accepted. Note: Write “Blog for Food” in the “Tribute In Honor Of” blank on the donation form. That way Tami and Kathleen can keep track of donations as they come in and let readers know how it’s going. I lost the original recipe for ‘Claudette’s Lemon Cake’ (Gourmet 1979) but this is pretty close. It’s a snap to make even for the non- baker. I’d say it keeps well but I’ve never put it to the test. In a bowl, beat together the sugar, butter, and eggs until just combined. Add the flour sifted with the salt and baking powder. Add the sour cream and milk. Don’t overbeat. Place the batter in a buttered loaf pan and bake until golden brown about 55 minutes. Transfer the pan to a rack. Combine the juice and pulp of the lemon and the sugar. Spoon this glaze over the hot cake and let cool in the pan. Run a metal spatula around the inside of the pan and turn out the cake onto a plate. To store: wrap up tightly in plastic and foil. Freezes well. Thanksgiving is the same and different every year. For consistency, I thank the turkey and the trimmings. After that, it’s a free-for-all. Rarely solemn, sometimes hilarious (relatives), combative (politics), aggravating (relatives), or poignant (the past), Thanksgiving gets to me year after year. Has there ever been a more comforting meal? I think of it as a solace (We’re here in this moment. With this turkey. We’ll eat and talk and shore ourselves up a bit.) The clink and clatter, the munch and crunch, the chuckle and the sigh make us content. Hope and optimism, like turkey and stuffing, are things to count on, and this year, they are particularly honored guests. Grimmer times are hard to ignore but we can take pleasure in our hopes for the future. Pass the gravy! And let’s not forget that mischievous guest, Chaos, who always shows up, like it or not, wearing his usual disguises. Sometimes, he’s the burned pie, the thoughtless remark, or the broken heirloom. But, welcome Chaos. * Our world is not perfect and we can be thankful there too. I don’t think a warehouse would be big enough for all the recipes, methods, and pointers involving the turkey itself. Tips on using Thanksgiving leftovers could fill a silo. Still, it makes for fun reading and adds a little freshness to the grand old meal. I never thought of making an Asian salad with leftover sweet potatoes and red cabbage. Or dumplings out of dressing. Don’t eat leftovers right away. And definitely, don’t have warmed-up turkey four days running. On the other hand, don’t rush your leftovers to the freezer either. You’ll have a mutiny on you hands when the first sandwich seeker can’t locate the turkey. But a careful division of the vegetables, meat, carcass, gravy and any other trimmings is a sound idea. Package, freeze, and store with labels so that when (in a week or so) you feel like making turkey soup for a Sunday night dinner, you will know where to look. And be reasonable. You’ll use up small portions whereas a football-sized lump of mashed potatoes or a pail of gravy could linger in the freezer until the 4th of July. Cooks in mid-20th century America were advised to conceal leftovers by putting a new face (literally) on yesterday’s meal. Sliced meatloaf, for example, with olive eyes and a ketchup smile. Another visual ploy: the architectural main course. Sausage Stockade leaps to mind. In this dish, mashed potatoes are surrounded by breakfast sausages to form a large rectangle. Heated up with a parsley ‘flag’ stuck in the center and it’s, ‘Hello Fort Dodge!’ But, don’t get me wrong: as funny as some of these concoctions sound, the idea of making up something new from something old is terrific. Maybe we’re just not as funny now: we don’t want to eat foods that contain words like Surprise, Heavenly, or Chuckwagon. But we also don’t cook as much so we don’t have the same need to doll up last night’s dinner. Nevertheless, from my reading of the news, folks are spending less time and money in restaurants which means that cooking leftovers may be an art in recovery. Seasonal, Warm, or Charred might describe our twice-cooked offerings. So have a wonderful Thanksgiving and save those bones! *A tip of the hat to Margaret Wheatley whose book Leadership and the New Science explores the idea of chaos as ‘order without predictablity’. A fascinating book. Here are a few suggestions for Thanksgiving revisited. Prepare the dressing with the ingredients below and toss. 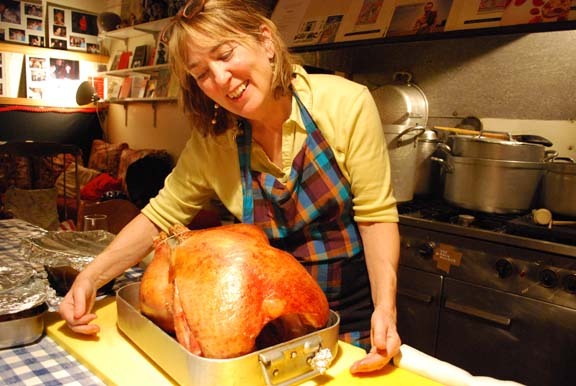 A turkey carcass will yield a good strong broth but don’t over cook it. Break up the turkey carcass into pieces. Put these into a large pot and just cover the bones with cold water. Add the remaining ingredients, bring to a boil, skim any froth from the top, lower the heat and simmer, uncovered, for about two hours. Taste. It should be well flavored but will need salt. If it’s too thin in taste, cook a bit longer. Strain and season with salt. Let the broth cool and skim off the fat. For a richer soup, you may want to add some vegetables and herbs (peas, green beans, finely cubed fresh zucchini, chopped parsley or chives for example). Beat the eggs lightly and mix into the stuffing. Add another egg if the mixture is too dry. Form into medium-sized balls and add to simmering broth. Gently heat and serve. Here we’re trying to get the most out of leftovers using some concealment practices. Grease a 9 x 12 inch baking dish. If you have the time, fry the tortillas briefly in a small amount of hot oil. Drain and salt lightly. First, we’ll heat the leftover gravy and season it with some cumin and oregano. If your gravy has a lot of sage in it, you may want to omit the oregano. Adding a lot of different seasonings – or fresh garlic, say- will not make a better sauce. Keep it simple. Spread about 2 tablespoon of this sauce in the baking dish. Cover the dish with 3 or 4 tortillas (plain or sauteed as described above). Add a layer of turkey. Mix the tomatillos, chiles and cilantro together and spread a few spoonfuls of this mixture to the turkey. Cut the sweet potatoes and/or the sprouts into small slices or cubes. Mix together with the peas. Add a thin layer of these vegetables and top with another layer of tortillas. Repeat the layering ending with the vegetables. Sprinkle the top with shredded cheese and bake at 350 for 30 minutes or until bubbling. Becky Howe’s idea of a fine solo dinner is a protein bar, a banana, and a good book. Well, friends, there’s a middle road. Cooking does get easier with practice and easier still once it becomes a routine. If you’re ready to rattle the pots and pans, summer is a great time to get started. There’s a lot less cooking and more salad making. The fruits and vegetables available now make for quick suppers without a lot of kitchen time. When the first dog days of summer rolled around in Washington, D.C. (often in May), my sister-in-law Debbie Giese would announce, “That’s it! No more cooking for the summer.” Twenty years ago, what this meant was “I’m not going to use the oven.” Dinner still made it to the table on a nightly basis but there were salads rather than stews and we used the charcoal grill rather than the stove. Even as recently as fifteen years ago, most people I knew made dinner every night and worked full-time. We used processed convenience foods but more often than not, they constituted a small part of the meal, such as bottled salad dressing or a can of soup. Slowly but surely, what was an insignificant part of a home-cooked meal began to take over and from there, it was a quick road to take-out or going out. I mention all this not to wag my finger at the current state of dining culture but simply to point out that home cooking didn’t go into decline all that long ago and for thousands, it never went away at all. In other words, the system is not broken or antiquated; it just needs a little dusting off. So even though we all know that day’s end can be especially chaotic, let’s creep into the kitchen and cook dinner. Consider the evening meal a set part of every day. Put another way, identify the after-work routine as the reverse of the morning routine. Does it take an hour to dress, have breakfast, and leave the house? Morning activity in most households is focused. In the same way, allow for focused time when you get home. Perhaps you need 15 to 20 minutes when you come in the door to do some or all of the following: check the mail, change clothes, listen to messages, supervise homework and baths, walk the dog, or water the garden. After that, head for the kitchen. Here are 6 steps, 7 tips and A Week of Menus to ease your way. Bonus section: Equipment and 4 How-Tos. Step 1: The Preliminaries. Write up a Week’s Menus and do your Shopping in advance. Not so different from my 1980 menu (see photo above) which is a little hard to read but Sunday is “Out” and Thursday is called “Potluck” (i.e. leftovers.) Hmm, that week we had roast chicken, steak, and hold on! Is that Ranch Dressing on my shopping list? For inspiration, there are websites to help with the menu planning: At Epicurious.com, go to Articles and Guides and under that Everyday Food. Select ‘Weekly Dinner Planners.’ There’s a different seasonal menu every week plus a shopping list. At This Week For Dinner (www.thisweekfordinner.com) , the author of this blog posts a menu every Sunday and invites anyone to comment or post their own menus. The New York Times now has a cooking newsletter than shoots rapid encouraging recipes to your inbox a few times a week. They are usually quick to make and very tasty. If you know in advance what’s for dinner, that question doesn’t seem so bad. Step 2: In the Morning, check the Menu and locate the Ingredients. Defrost any food you will use later. If you have even 5 minutes to spare in the morning, do one small job to make the dinner preparation go faster. This might be peeling some potatoes (leave them in a bowl of cold water), or hard-boiling a couple of eggs. Some advance preparation can be done days in advance such as washing and spin-drying the lettuce. Step 3: When You Come in the Door, put a large pot of water onto boil and/or light the grill. In other words, don’t waste time waiting for the grill to heat or water to boil. Start in right away and you’ll save time. If speed is your goal, the week-night meal is not the time to try a new recipe. In fact, don’t use a recipe at all. Use techniques such as grilling, boiling, steaming, chopping, sauteeing, and tossing. Season well, add a little butter or a dash of olive oil, and your food, while perhaps a bit plain, will taste very good. Put out everything you need including salt and pepper, water, plates, glasses, drinks, and condiments. This means that when dinner is ready, the table will be ready too, and the food won’t get cold. Step 5: Triage or Who gets attention first? If you have a screaming toddler, this question doesn’t need asking. But don’t be sidetracked. Throw your offspring a piece of fruit, a cracker, or a carrot, and carry on. Believe me, children are impressed by a show of fierce concentration. Likewise, once you begin the cooking, don’t answer the phone, do the laundry, or check your e-mail. We’re only talking about a half hour of concentration. For a cold dinner of salads and cold meat or fish, do all the prep work first. Arrange everything on a platter or in bowls, putting the dressing on last. Vinaigrettes and dressings keep very well refrigerated. Make double portions and save the extra for the next meal. Now to fine tune the process, here are 7 tips. Don’t get discouraged. If nightly cooking seems like a terrible chore, keep in mind that repetition and practice will reward you. Don’t get bogged down by recipes. Start with some dishes that you can cook without running back and forth to check what to do next. “if I use a cookbook, dinner takes 5 times as long.” again from Jessica. Memorize how to cook rice, how to bake and boil potatoes and how to hardboil eggs. See below *. Don’t buy too much food. You’ll use what you buy, your refrigerator won’t be bursting, and you’ll save money. Clear the decks. Try to get some room on the counter to work. Get rid of the mail, your backpack, and anything else that is cluttering up that space. Trust your own common sense. Don’t be a slave to timing instructions. Pasta is a good example: the box may instruct you to cook the pasta 9 minutes but don’t stand around waiting for it. At about that time, taste a strand. If it’s done, drain it. Otherwise, hold off a minute or two and taste again. Learn to use high heat when you cook. It is one of the hardest things to convince newer cooks to do but turning up the heat on the stovetop will improve your cooking. Without a hot pan, you can’t sear, stir-fry, saute, or brown foods successfully. Foods will absorb less fat if sauteed in very hot oil. Use salt and pepper. Plenty of it. Butter, olive oil, and herbs as well. Season your food and taste it before serving. Jessica says this dinner take 20 minutes tops! And no complaining from the young ‘uns either. Preheat oven to 400. Bring a big pot of water to a boil. Salt and pepper thin sliced pork chops (1 per person, maybe 2 for Dad), sprinkle with rosemary, and put in a baking dish. Bake for 15 minutes turning once. Chop up a couple of tomatoes and a cucumber, season, and drizzle with olive oil and vinegar. Meanwhile, shuck corn (1/person, maybe 2 for really hungry folks.) Cook in boiling water 2 minutes only. Have butter and salt on the table. Salade Nicoise is a composed salad which means lettuce is the bed, the other ingredients are arranged on top in clumps, and the dressing goes on last. Ingredients: 1 head romaine lettuce, a can of tuna, 2 hardboiled eggs, a big handful of fresh string beans, 4-6 small potatoes, some cherry tomatoes, a can of anchovies, if you like them. In the morning, boil the eggs and peel the potatoes. As a first step, boil or steam the potatoes for about 6 minutes. Add the beans to the same pot and cook 5 more minutes. Check the potatoes for doneness. Drain, cool down, and cut the potatoes into halves or wedges. Quarter the eggs. Put the lettuce in a big bowl and strew all the ingredients over the top. Make a vinaigrette with garlic, olive oil, and vinegar or lemon and drizzle over the salad. For the salad, use raw zucchini, very thinly sliced or in little cubes. Drizzle with basalmic vinegar, olive oil, salt, and pepper. Fast pesto: Can be made in advance! 2 packed cup of basil leaves, 3 tablespoons of pine nuts (or walnuts, hazelnuts, almonds – whatever you have on hand), 1/2 cup olive oil, pinch salt, a garlic clove, 1/2 cup grated Parmesan cheese, 3 tablespoons butter. Puree all these ingredients in a blender or food processor. At serving time, stir in a few spoonfuls of the hot pasta cooking water. This can also be frozen in small containers for super quick suppers! You made it through the week! Don’t cook – just put this on a big plate and enjoy your dinner! Fast hummus that’s cheap too: 1 can chickpeas, 2 tablespoons (or more if you like it) sesame tahini, 1 small garlic clove, salt, pepper, juice of 1 lemon, 2 – 4 tablespoons of water. In the food processor or blender, add all the ingredients and puree. Taste for seasoning. Put in a bowl and drizzle olive oil over the top. I’ll write the recipe below but this takes only a few minutes of concentration and the rest is nearly automatic. Relax! It’s the weekend. To make quick fish tacos: Make the slaw and dressing first. Cook fish right before serving. Slaw: 1 small green cabbage, shredded finely; bunch of cilantro, chopped; a shredded carrot, and a bunch of radishes (optional), chopped. Mix this together, add salt and some squeezes of lime juice. Sauce: Mix together juice of 1 lime, a couple of tablespoons each of yogurt (or sour cream) and mayonnaise. Pinch salt. Pinch sugar. Garlic clove minced. Hot sauce or a minced chipotle chile. Corn tortillas (flour is ok): Spread with dressing, top with slaw and fish. Put on plates or a big platter. Serve hot sauce on the side. 4 – 5 servings. Mango (or peach) Floats: slice up the fruit, put in tall glasses with ice cream and club soda. Eat with a spoon. I knew a surgeon who used to save leftover salad, add some tomatoes and presto! he had gazpacho. I don’t often have leftover salad but I still think it’s an original idea. Soup (from leftovers) – Gazpacho! Fast gazpacho: use any leftover salad vegetables for this soup or gather up the ingredients in the recipe below. In a blender or food processor, blend the vegetables until they are in small chunks. Add enough water or juice to thin slightly. Season with salt, pepper, cumin and vinegar. Add a few spoonfuls of olive oil. Let the soup sit a while to develop more flavor. Taste for seasoning before serving. Knives: Equip yourself with 3 good knives. In the photo above are the knives I use nearly exclusively. They are (from top to bottom) a small paring knife (serrated, in this case), an all-purpose chef’s knife, a bread knife (used for slicing meat and tomatoes too) and my new favorite a santoku knife. This last replaces my chef’s knife for most purposes and is a reasonable purchase (between $30 and $60). The serrated bread knife and paring knife are dirt cheap but when they get dull (and they will! ), you must replace them. The key here is sharp. If you know how to sharpen knives, you are way ahead of the game. It’s easy to chop when you have a sharp knife. I can’t emphasize this enough. Cutting Board: The knives in the photo are sitting on my cutting board which measures 15 by 20 inches and is made of rubber that is pleasant to chop on and easy to keep clean. No, I can’t fit it in my dishwasher but it is indispensable. Not easy to find in stores but restaurant supply stores have them. These stores are open to the public) and you can find sources on line. When using a cutting board, anchor it to the counter by setting it on a damp towel or wet paper towel. Small boards that slip around as you chop are an invitation to the First Aid station. Salad spinner, sieve, metal bowls, tongs, and box grater: I use these all the time. The bowls are very thin and light. I get them in several sizes at my local restaurant supplier for next to nothing. They are so much easier to use than heavy glass bowls and if one drops, so what? A big pasta pot, a big heavy stew pot, a big frying pan and a medium-sized frying pan: I have assorted other pots and pans but the four mentioned are the ones I use all the time. I’m not too crazy about non-stick or otherwise coated pans but I do have a big one that comes in handy now and then. I like heavy duty stainless steel frying pans because you can really heat them up without damaging them. 2 baking sheets with rims, a roasting pan and a couple of baking dishes:Baking sheets (cookie sheets) can be used for all sorts of baking and lined with non-stick paper, they are a snap to clean. An 8 inch square and a 9 x 13 inch glass pan is a kitchen standard. A heavy duty ceramic or enamelled cast iron baking dish is very useful for roast chicken, potatoes au gratin, and all kinds of baked dishes from leftovers. Food Processor: In the world of small electronic gadgets, a heavy duty food processor is my favorite. Small one or two cup processors are a waste of money, in my opinion, because they are usually not sturdy and don’t chop well. If you hate chopping onions, this will be a godsend. Likewise, if you have a lots of chopping, slicing, or grating to do (coleslaw, as an example), it will take seconds using a food processor. It’s great for soups sauces; fantastic for pie crusts and currently, I use it to make ground beef. I’ve used a Cusinart model with a lot of success. Ask for one for Christmas. It is so much better than a blender. Bake potatoes: Scrub a russet or other baking potato (yes, there’s a difference! Ask your vegetable person at the store). Bake at 425 (you don’t need to preheat the oven) for an hour. For extra crispy skin, take out the potatoes after about 50 minutes of baking and let them sit a few minutes until the skins are soft and wrinkly). Put them back in the oven for an additional 5- 10 minutes. Boil potatoes:Scrub boiling potatoes. Peel if desired and cut in halves, quarters, or leave whole. Put in a pan with cold water to cover and a spoonful of salt. Bring to a boil. Lower heat and simmer until done – which will take about 15 minutes or so depending on how many potatoes you have. Test for doneness by plunging a knife into the side. Drain. Make rice: Here it depends on the rice. Again, don’t be a slave to the timing – check your rice and taste a grain or two; when the water is absorbed, it’s done. For long grain: 1 cup rice, 2 cups water, 1 tsp. salt. Bring the water and salt to a boil. Add the rice, stir once, cover and cook at low heat for 20 minutes. For basmati, jasmine or Thai: 1 cup rice, 1 1/2 cups water, 1 tsp. salt. Rinse off the rice thoroughly in a strainer. Cook as for long grain but only about 10 minutes. Hardboil eggs: Put eggs in a pan with cold water to cover. Bring to a boil, lower heat and cook for about 8 minutes. Drain and cover with cold water (I use ice cubes too sometimes). If an egg cracks during the boiling process, add salt – it will seal the crack.